If you do a lot of original writing in your real estate business (even if it's mostly related to marketing), you'll be happy to know that this can be a great help to you as far as attracting buyers through advertising. The best way to gain clients is to create and offer ads that catch them early — with a catchy title. Here's how to make that all-important title an attention-grabber. Just when many agents thought they had a solid plan for their real estate advertisement titles, along came the internet. Even though online real estate is a game changer, all of those best practices aren't out the window. You'll still need a headline that catches the attention of the reader or prospect, and you likely have limited space in which to place it as well. The internet complicates the real estate industry a bit because of the syndication of listings. 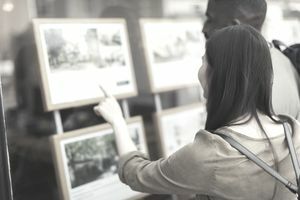 Just take a look at Realtor.com, as it gets listings from local MLS's and re-formats them for the site. Everything becomes a linked address — which in all honestly isn't the best example of an attention-grabbing headline or title. It creates a uniform display, but uniformity only means your home advertisement disappears into the pile. Don't just start your description with the location, bedrooms, baths, etc. — make the very first description sentence an eye-catching title. This usually will show up in the aggregate display of listing search results, and surely will be the first thing potential clients will read in the detail view screen on just about any site. The title of your internet page content is arguably the most important factor in getting a click and a page view. The title is what shows up in searches, and it only takes a second for a searcher to make a decision on where to click when presented with multiple choices. ....Most professional copywriters' headlines will have 30%-40% EMV Words in their headlines, while the most gifted copywriters will have 50%-75% EMV words in headlines. "The Importance of Title Insurance"
Believe it or not, this got the absolute bottom score of 0.00% The AMI Institute's analyzer rated this title with the following feedback: Your headline either has no words that invoke emotional impact with people person, or the percentage of such words is so low as to be unlikely to make any emotional impact. "Don't Lose Your Home for a Title Issue"
We jumped up to 25.00% with this title. Here's the info as per the analyzer: Your headline carries words that have a predominantly Spiritual appeal. AMI research has found that Spiritual impact words carry the strongest potential for influence and often appeal to people at a very deep emotional level. "How to Lose Your Home"
You just hit professional copywriter scoring at 40.00%! According to the analyzer, your headline carries words that have a predominantly Spiritual appeal.